Always have your phone on you? Turn your Android smartphone into your wallet with My Mobile Wallet. Securely add your ScotiaCard® debit card and American Express card on your smartphone. Then, just wave your smartphone over the point-of-sale terminal to pay for purchases under $100 anywhere you can tap your card. No need for a plastic card or signature. You can also quickly make payments without launching the Mobile Wallet by setting up the "Pay Ready" feature. Simply wake up the device or if it's already in use, just wave it over the point-of-sale terminal to pay. You can use My Mobile Wallet anywhere you see the symbol. Your privacy is protected and your card details are not shared or stored on your device. Plus with Interac Zero Liability Policy, American Express Fraud Protection Guarantee3 and Scotiabank's Mobile Security Guarantee you are protected from fraud and unauthorized card usage. Keep an eye on your monthly spending anytime, anywhere with instant balance updates and access to your transaction history. Download the latest version of the Scotiabank Mobile Banking app, then add your card to My Mobile Wallet. A compatible NFC enabled smartphone with Android 4.4 (KitKat) or higher. Please note that My Mobile Wallet will not be available for rooted smartphones. Rooted phones are devices that have been altered to remove the limitations placed by a device manufacturer, thus allowing the user to attain control of the Android mobile operating system. 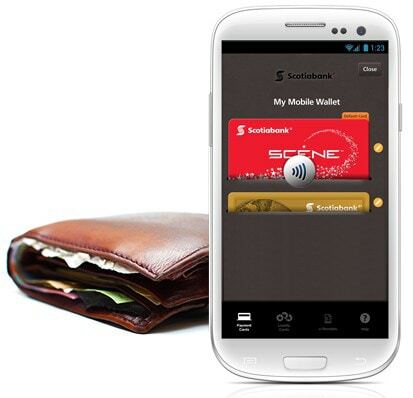 My Mobile Wallet is a feature within the Scotiabank Mobile Banking app. The Mobile Banking app can be downloaded from the Google Play store. All eligible cards will be automatically displayed when you are ready to add your cards in My Mobile Wallet. Currently, you can use My Mobile Wallet at thousands of locations. Just look for the contactless payment symbol at the checkout of your favourite retailer in Canada, the U.S., and internationally. You can also quickly make payments by setting up the "Pay Ready" feature. "Pay Ready" is a My Mobile Wallet feature that lets you make a quick purchase using your default payment card without launching the Mobile Wallet. Tap the pencil icon beside your default payment card. Note that the "Pay Ready" feature only works with your default payment card. Tap the toggle switch to enable the "Pay Ready" feature. Place and hold your device near the POS terminal to make a payment. NFC stands for Near Field Communication – a short range wireless technology that enables devices to securely communicate at close distances (up to 5 cm). Yes. Use My Mobile Wallet for most everyday purchases up to $100 wherever tap is accepted+. You will still need your physical Scotiabank card for purchases over $100. If you reported your Scotiabank plastic card as lost, stolen, or compromised, your card will be suspended in My Mobile Wallet. Once you receive your replacement card, please delete the suspended card and add your new card to the Mobile Wallet. If you reported your device as lost or stolen, we’ll suspend all of your cards in My Mobile Wallet to prevent unauthorized purchases from your device. However, you can continue to use your Scotiabank plastic card. To add your SCENE membership card into My Mobile Wallet, just tap on the SCENE membership card that appears on the "loyalty cards" tab on screen. A screen will appear for you to enter your black SCENE membership card number (that begins with 604646) and your password. The barcode for your black SCENE membership card will then be accessible through My Mobile Wallet, and your black SCENE membership card will be added successfully. If you can't find your SCENE membership card, check your email inbox to see if you have an email from SCENE. Your SCENE membership number is included in most emails. Not there? You can request a replacement card online. Can’t remember your password? Click the “Forgot Password” link and try logging in with the answer to your security question. Your password and secret question answer are case sensitive. Or you can contact help@scene.ca or call the SCENE Help Centre at 1-866-586-2805. To view your SCENE points balance, select your SCENE card in My Mobile Wallet, then select "Tap to reveal SCENE points". You can also view your full points history at m.scene.ca. eReceipts allows you to store and access your digitized receipts on your device via the Scotiabank Mobile Banking app. When you subscribe to the eReceipts program you will create a unique @scotiareceipts.com email address. When shopping at participating merchants, enter this email address or give it to the merchant upon checkout, and your digital receipt will be emailed, archived, and automatically matched to the corresponding entry in your transaction history. Use the eReceipts camera capture feature to take a picture of the receipt. The receipt will be digitized and made available in the Scotiabank Mobile Banking app. Sign in to the Scotiabank Mobile Banking app. Select eReceipts from the main menu or the Mobile Wallet and follow the prompts. Select More > Unsubscribe and follow the prompts. Your eReceipts email address is a unique address created by you when you subscribe to the service. If you’ve already created your eReceipts email address, you’ll find it displayed at the top of your receipts list screen. Please note that your eReceipts email address is not intended for personal, non-receipt emails. Its sole purpose is for gathering and syncing your receipts to your transactions. Please confirm that you correctly entered your eReceipts email address when you forwarded the receipt. You’ll find your eReceipts address displayed at the top of your receipts list screen. Look out especially for common typos in the word “receipt”. Yes. If you have a receipt in a personal or other email account, simply forward it to your eReceipts address and your digital receipt will be emailed, archived, and automatically matched to the corresponding entry in your transaction history. Unfortunately, we can’t guarantee that we can retrieve your deleted receipt. However, please call 1-800-275-5316 and a customer service representative will assist you. Unfortunately, no. Before unsubscribing, it is critical that you first export, download, and save your receipts. Once you unsubscribe from the service, any receipts you had stored are no longer available. When you subscribed to the eReceipts service you provided your consent to the collection, use, and disclosure of your anonymized personal information. We use a third party service provider in relation to this service, and that third party service provider will also have access to data in order to perform services on our behalf. For further information about Scotiabank’s commitment to privacy, a copy of the Scotiabank Group Privacy Agreement can be obtained at scotiabank.com/privacy or from any Scotiabank branch. You can withdraw your consent to participate in the eReceipts service (and disable the eReceipts functionality) at any time by selecting “Unsubscribe” from the eReceipts page. For additional assistance, please call 1-800-275-5316. Scotiabank Mobile Banking App users will no longer be able to add a Scotiabank Visa credit or prepaid card to My Mobile Wallet. Any Scotiabank Visa cards previously added before this date to My Mobile Wallet will not transact. If you have Scotiabank Visa credit or prepaid cards previously added to My Mobile Wallet you must remove that card from the service. Trade the mailbox for your inbox. Sign up for epost for FREE. You'll get your bills all in one place so it's easier to manage. When you're looking for a quick and secure way to send money to a Canadian bank account, Interac e-Transfer is your answer. † Interac, Interac Flash and Pay in a flash are trademarks of Interac Inc. user The Bank of Nova Scotia. + Merchants set their own limits for the maximum value of a contactless transaction that does not require a signature or PIN. 3 Certain restrictions and exclusions apply. Visit https://www.americanexpress.com/ca/en/content/support-cardmember/fraud-protection.html?intlink=ca:Amex:NewSiteSearch:RecomLink1 for a full description of the American Express Fraud Protection Guarantee. ∞Discount applies to the full purchase price (excluding taxes) and excludes Tim Hortons and alcoholic beverages. ++ SCENE members who present their membership card or enter their membership number at the time of transaction will receive a 10% discount on the purchase of admissions, valid for performances on Tuesdays only. Maximum 6 tickets. This offer is valid for the purchase of admission tickets only and cannot be used in conjunction with any other discount, passes, coupons, vouchers, pre-purchased tickets, SCENE point redemptions or any other admission offer. Offer is subject to change or may be withdrawn at any time, without notice.